It's getting better, but there's still room for improvement. That's the conclusion from tests by the Insurance Institute for Highway Safety (IIHS) for headlights on SUVs. According to the latest tests, the 2017 Hyundai Santa Fe and the 2017 Volvo XC60 are the only models available with good-rated headlights among the 19 midsize SUVs and 18 midsize luxury SUVs evaluated in this new round of tests. A dozen of the vehicles are available with headlights rated acceptable, while 23 don't have anything other than marginal- or poor-rated headlights. This is the fourth group of vehicles IIHS has evaluated since 2016. "As a group, midsize SUV headlights perform slightly better than the other SUVs and pickups we evaluated last year, and that's encouraging," said IIHS Senior Research Engineer Matt Brumbelow. "Still, we continue to see headlights that compromise safety because they only provide a short view down the road at night." 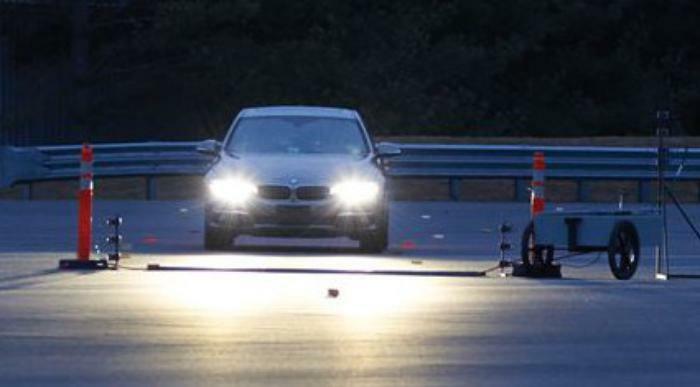 Nighttime visibility is critical to highway safety, according to IIHS, because about half of traffic deaths occur either in the dark or at dawn or dusk. Differences in bulb type, headlight technology, and even something as basic as how the lights are aimed all affect the amount of useful light supplied. Properly aimed low beams light up the road ahead without temporarily blinding drivers of oncoming vehicles. More than half of the 79 headlight variants evaluated have too much glare. In 17 of those cases, the headlights would be rated poor based on glare alone. Complaints about glare from oncoming headlights are common, research by the National Highway Traffic Safety Administration indicates.